Looking for a cool new Kids Activity to try today?? This one is great for working on small motor development with the smaller ones and plain ‘ole creativity with just about any age!! We used a Pampered Chef pan to hold our paint and it worked out quite well. It was not a cheap pan but we use it all the time(At least once or twice a week). I found a cheaper Nonstick Square Treat Cake Pan on Amazon that would work perfectly. We love making brownies in it, it makes chewy crispy edges on every piece. Individual Lasagna servings and Chicken Pot Pies are my families favorite recipe that we make in the pan. Ok…….. enough about the pan. With summer in full swing and the kids bored out of their mind already we have got plenty of kids activities in the making to share with you. 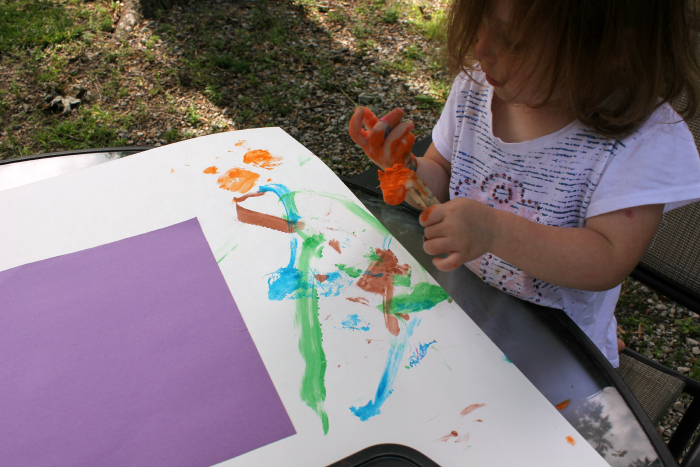 Last weekend we had a cotton ball painting activity that Charlee Ann just loved! I’m a few days late getting it up on the blog for you but we have had a really rough couple weeks with allergies! EEEK! Hopefully, you will already have the supplies sitting around the house so you can have your own painting festival this weekend! You may also like to try…..
Now, remember when you budding little artist is hard at work try not to fly in and be super mommy and “teach” them how to do it! Get everything set up and let THEM figure out what they want to do. A lot of times we are more worried about them doing their art the way it “should” be done than how they want to do it. Artist don’t always stay inside the box……as a matter of fact, a great artist ALWAYS works outside the box!! The cotton ball painting kids activity was very messy and fun. Which is the best part right? Charlee Ann had a great deal of fun painting her own hand with the cotton balls (she said they tickled). So we spent a great deal of time painting our own hands, each other’s hands, and making hand prints on the paper. Giggles were abundant and the whole activity kept her busy for over an hour. We enjoyed ourselves and had a pretty good giggly time! Don’t forget to display your child’s artwork proudly and by all means…… Get in there and get to painting yourself! Bonding with the kiddos is the best feeling in the world and they will remember it for the rest of their lives!! Happy painting all!! Grab your paint and set it up in your muffin or brownie pan. Attach wooden clothes pins to your cotton balls. Set your kids down and let them go at it!! 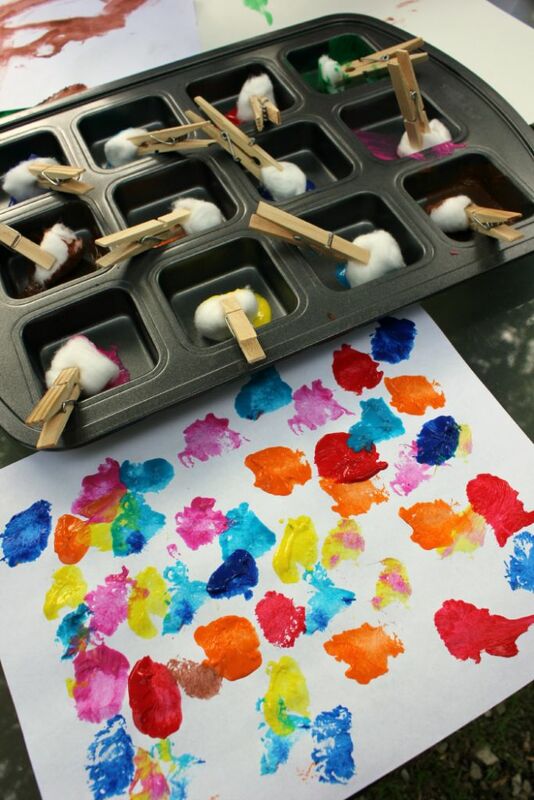 Did you kids like the activity “Cotton Ball Painting”?? There are plenty of ways to paint without a paintbrush! You might also like these two articles on Domestic Mommyhood, they are my most popular ones at the moment. Feel free to stick around as long as you want and check out the blog. If you are New Here check out this page for newbies! Scriptures to Help YOU be a Better MOM! What a fun idea! I’m sure my boys would LOVE to try that!! I like this idea and the clothespin as a brush works beautifully. I like that you can make a puff shape or drag it and do something else. I have done this before and really enjoyed it. I like it when they mix the colors and experiment with them too. It looks like it went well. Great for toddlers, but fun for all! I want to do this! I have a ton of paints, so I should totally try this. I’ve never even thought about painting with cotton balls. It makes so much sense! This is such a cool idea. I am definitely pinning this onto my children’s craft and activity boards. My daughter would actually enjoy this even at 5! This is so clever! I can’t wait to do this with my daughters! This is straight up a great idea! I wish I’d thought of this when mine were little. I had a couple of very fastidious kids who didn’t like getting paint on their fingers and they would have particularly enjoyed this. I’ve never done this before. It’s very creative! What a great idea! so simple and no need for expensive brushes to buy or wash! That’s a really fun idea,My kids love when we cut shapes in to potatoes and use them for painting. OMG you are genius. the clothespins!! WHY haven’t i thought of this???? What a fun idea and a great way to create. I think the cotton would help w/mess too since it’s so absorbent. What a great idea! We are going to have to try this, I never thought to use clothespins to hold the cotton balls! I had never thought about using cotton balls! That looks like so much fun, can’t wait to try it with my son! That looks like fun. I will have to try that with my kids this summer. What a smart idea! My kids would like this. How fun, Great idea for youngsters. love it! How super cool is this! I am totally doing this with my boys. Pinned. This is such a clever idea. It’s perfect for toddlers, but I bet older kids would enjoy this too. What a cute idea, to use cotton balls for painting. I guarantee my 5yo would paint herself. Now this is fun! What a perfect craft for the kids. I’d love to put them outside and let them paint away! That’s a good idea.ill have to try it. That is a great idea! I’m sure they had so much fun! What a unique idea. I think my kiddo would get a kick out of that! This is a fantastic idea! So simple but fun. My 5 year old loves painting with different kinds of things like this. This is such a great idea…my son did cotton ball painting in his daycare. However using a muffin pan for paints is genius. This is such a great idea! I just got back from pinning this to my kiddo activity board on pintrest! I’ve never heard of anything like this before! It’s such a great idea and it looks like toddlers would LOVE it. Super fun idea for the summer! And easy clean-up- no washing out brushes. Just toss the cotton balls! What a fun idea! This would be great for a backyard party with kids. will share it with my friend who is planning her daughter’s 4th birthday. I love this. I think I’ll schedule a playdate next month with my moms group and do this outside. also using a large zip lock that fit a 8×13 construction paper, adding paint on paper, zip locked, lay on table paint facing up and let the fun begin…. It called “no mess art” I used to do this with my Toddlers… Have Fun !! We just got done doing this. What a great and simple idea! Thank you. my boys, 2 and 4 loved it. We used a styrofoam egg carton to hold the paint. Worked great. 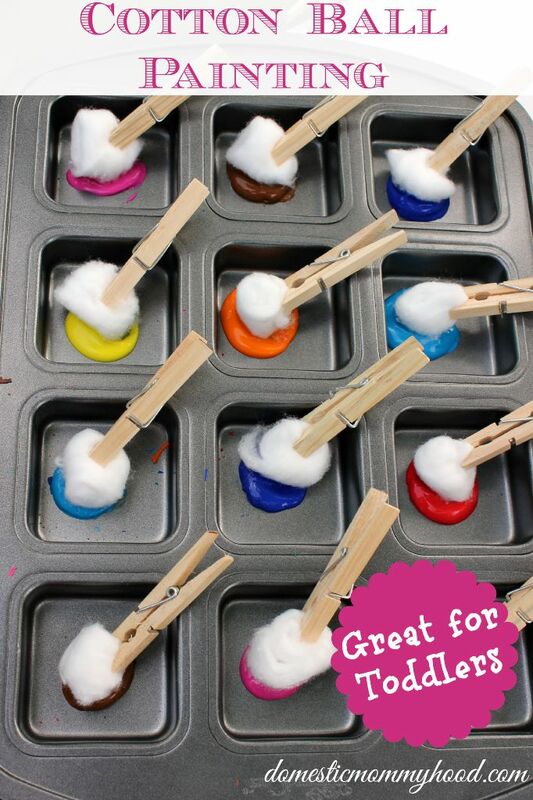 I have not thought of using cotton balls before to let kids paint with attached to clothespins. What a great way to save some brush cleaning time and not get the colors mixed up. Definitely great when you can add skill building and fun all in one! Bekki, this looks like so much fun! My 1 and 3 year olds would love to do this and I could even implement it into a birthday party activity for my son next month. Shared all over! Thank you. How much fun would that be!! What a great idea Jelli! I did have someone recommend using egg cartons instead of muffin tins. That might help with a big group!